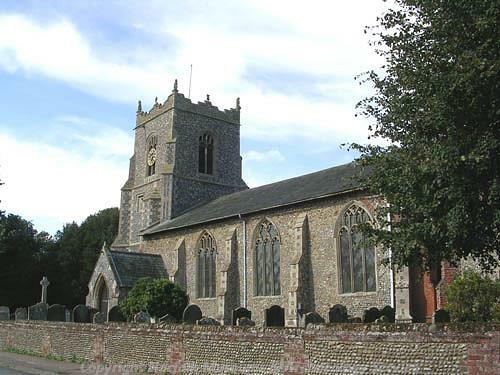 The Breckland parish of Scarning is situated in central Norfolk, to the west of East Dereham. The origins of its name are somewhat obscure, but may come from the Old English for ‘dirty brook’. People have lived in the area for a long time, and settlement was certainly well established by the time of the Norman Conquest, the parish’s population, land ownership and productive resources being detailed in the Domesday Book of 1086. The earliest dateable evidence of human activity comes in the form of a Mesolithic flint blade (NHER 25436) and a flaked flint axehead (NHER 36096). Neolithic flint finds are polished axeheads (NHER 2862 and 43139), a scraper (NHER 49994) and some unspecified tools found in the early 20th century (NHER 2861). Two flaked flint axeheads (NHER 29654) recovered from a foundation trench in 1985 may be Neolithic or Bronze Age in date. The only other Bronze Age find at present is a fragment of copper alloy rapier blade (NHER 31038). Iron Age objects are coins (NHER 30530 and 35972) and a brooch (NHER 30530). Although no evidence has yet been found for Roman structures, quite a number of Roman objects have been recovered, including coins (NHER 22170, 30530, 31081 and 34012), brooches (NHER 30530, 31081 and 49075), pottery fragments (NHER 30530 and 49129), a harness mount (NHER 34104), part of a puddingstone quern (NHER 49970) and a hairpin (NHER 49993). Saxon finds include finger rings (NHER 30530 and 35972), buckles (NHER 50242), a stirrup terminal (NHER 34148), a disc brooch (NHER 49129) and a hooked tag (NHER 49993). The medieval period has left the parish with its earliest surviving building, the church of St Peter and St Paul (NHER 2891) in the centre of Scarning village. This is a medieval and later flint, brick and stone parish church, consisting of a west tower, an aisleless nave with a south porch and a chancel with a south vestry. The earliest part of the building is probably the nave, which may be 13th century and certainly pre-dates the 14th century chancel and south porch. The west tower is 16th century with a later top. The unusual two storey south vestry dates to 1576. The whole was restored, the chancel heavily, in 1869 and 1984. Inside is a 13th century font with a tall spire of a cover, a late medieval painted rood screen with tracery and some good memorials. The east window is from about 1862 and is very rich and High Victorian, as are the other chancel windows. Park Farmhouse (NHER 21924) on Watling’s Lane, now two dwellings, is a late medieval house, remodelled and extended in the 17th and late 19th century, with brick obscuring or replacing the original timber framing. Inside, one room has elaborate late medieval beams. Other visible beams are 17th century or later. Other medieval structures have not survived but have left a physical footprint as evidence of their former presence. In the northwest of the parish is a medieval moated enclosure (NHER 17696), still in good condition, that would have once had a building on its central island. The north and west ditches are fed by a stream and are water-filled, the rest being boggy ground. A possible entrance to the central island is to the southeast. The current Scarning Hall (NHER 13175) to the west of the church is on the site of a medieval moat that was visible until the late 19th century, when it was filled in. The house currently on the site is an 18th century two storey building with cellars and attic, rather dominated by a giant late 19th century south extension. Still other medieval buildings have disappeared completely, but scatters of contemporary finds show their location. Of medieval Drayton Hall (NHER 2874), nothing can be seen, but scatters of medieval and later pottery fragments and other objects mark its former position in the east of the parish. Further south, a concentration of medieval pottery fragments was noted in 1994 in an area for which there is documentary evidence for a medieval house with outbuildings and land (NHER 30530). Finally, some buildings have vanished entirely. Nothing remains of medieval Northern Hall (NHER 2884), which stood to the north of Dereham Road, and no finds have been located in the area. A large number of medieval objects have been recovered, mainly by extensive metal detecting. Selected examples include coins (NHER 30839, 31081 and 32976), buckles (NHER 30839, 34102 and 34104), pilgrim bottles (NHER 34361 and 49129), a pendant (NHER 32976), an elaborate brooch (NHER 49075), an unusual key (NHER 31080), a horse harness pendant (NHER 34103) and mount (NHER 49076), a cloth seal (NHER 30839) and a jetton (NHER 34103). Many pottery fragments have also been found (NHER 25436 to 25439). Of the post medieval buildings to survive in the parish, the majority are 17th century. Old Hall Farm (NHER 2886) on Watery Lane is a fine 17th century and later two storey timber framed and colourwashed brick farmhouse with cellars and attics. The original block has been extended from the side to form an L shape. The interior has some panelling, a dog-leg stair and a fitted cupboard, all 17th century, and one 18th century panelled room. Scarning Dale (NHER 16366) is a 17th century two storey timber framed house on the lobby entrance plan. It was much remodelled in 1900 when a half timbered and jettied cross wing was added incorporating antique woodwork from elsewhere. Finds of medieval monastic masonry were made in 1995 in a nearby 19th century barn, probably originating from Wendling priory. Railway Farmhouse (NHER 22126) on Fen Road is a 17th century and later one and a half storey pebbledashed timber framed farmhouse with a thatched roof and modern extensions to the side and rear. Straddling the border with East Dereham is Vicarage Park (NHER 33465) (the vicarage itself is in Dereham). The park was first laid out in 1678 and covered eight acres but by 1815 it had expanded several times and now covered a hundred acres. Seventy acres were planted as parkland with walks to the church and to the southwest. Tree belts were added in 1838 and the watercourse was straightened in 1844. Beech hedges were planted within a moated site in the park by 1889. Part of area is now built over, part a public open space and part private gardens. Poplar Farmhouse (NHER 46211) on Manor Lane is an early 19th century two storey brick farmhouse with a three bay façade of sash windows and a panelled front door with a pedimented doorcase on channelled pilasters. The Grange (NHER 46210) on Dereham Road is a two storey brick former farmhouse of about 1840 with pantile and slate roofs. The three bay façade has sash windows and a slightly recessed centre bay beneath an arch, in which there is a fine doorcase with Tuscan columns and a traceried fanlight. A single storey canted bay stands at the side of the main block and there are irregular service extensions to the rear which may pre-date the main block. Quite a number of post medieval objects have been found in the parish, including clay pipe stems (NHER 25437, 25439 and 25440), a sword belt mount (NHER 30530), lead cloth seals (NHER 30839 and 34361), jettons (NHER 30839 and 34361), buckles (NHER 31038 and 34104), a candle snuffer (NHER 49994) and an iron dragon figurine (NHER 41147) found on Scarning Fen. The most historically recent entry on the archaeological record is a World War Two hexagonal brick-faced concrete pillbox (NHER 32430), in a hedge to the south of the A47. It dates to 1940 and was part of a network of anti-invasion defences of the time.